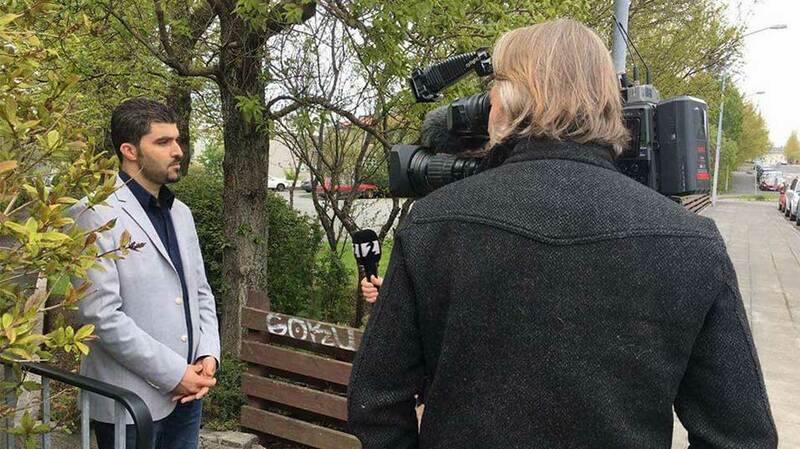 Dr. Jumane Qunnaisse, chair of the Department of Media, and Dr. Mohammed Abualrob, a professor of media at Birzeit University, recently delivered a lecture on Palestinian media to Icelandic media professionals, professors, and supporters of the Palestinian cause at the University of Iceland. The lecture, part of a visit to the university’s campus from May 21-25, 2018, revolved around the Israeli-imposedchallenges and obstacles faced by Palestinian journalists, reporters, and students. Qunnaisse and Abualrob also detailed the Israeli violations of Palestinian rights, as well as the killings, arrests, and restricted mobility inflicted on the Palestinian population. Birzeit University’s professors highlighted the role of social media platforms in raising global awareness of the Palestinian cause and the campaigns led by Palestinian youth to increase understanding of the circumstances in Palestine. The lecture also revealed the Israeli surveillance of social media platforms and the punishment of anyone who attempts to research the Israeli violations. In addition to the lecture they led, Qunnaisse and Abualrob met with a number of gender, social sciences, and media professors during their visit to the university, which was part of a two-year, European Union-funded Erasmus+ student and faculty exchange program between the University of Iceland and Birzeit University. Earlier this month, representatives from Birzeit University and the University of Iceland signed a two-year agreement that will lead to increased research cooperation and student and faculty exchange between the two universities. The professors also met with Birzeit University students who had wrapped-up their five-month research projects at the University of Iceland. The projects, supervised by international professors, were part of a worldwide student exchange program. At the end of their visit, Qunnaise and Abualrob met with Vigdís Finnbogadóttir, the fourth President of Iceland, who served from 1980 to 1996, as well as representatives from the Icelandic Ministry for Foreign Affairs and supporters of Palestine headed by Sveinn Hauksson, who chaired the Iceland-Palestine Association for more than 10 years.